By combined operation, MMX-BP-200-05DX1 matches flexibly to various materials and various applications, and also to small production and huge production. Independent operation of each combined unit is possible. Independent or combined operation is possible at the operator's discretion. Maintenance is possible with every single unit. Even when a certain unit stops for the maintenance purpose, the other units can be operated for production. 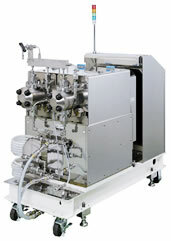 The whole machine can be controlled by operating only the principal unit. Data from the principal unit can be shared among all units. Every plunger of all combined units can be controlled automatically, and simultaneously. 5L~20L/min for heat exchange. 2L~5L for plunger cooling.